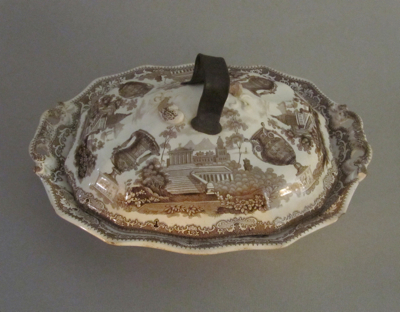 This English pottery covered vegetable dish measures 12.5 inches by 10.25 inches and has brown transfer decoration of Greek buildings, urns, and classical figures. 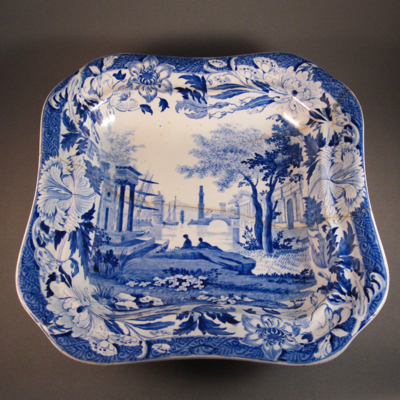 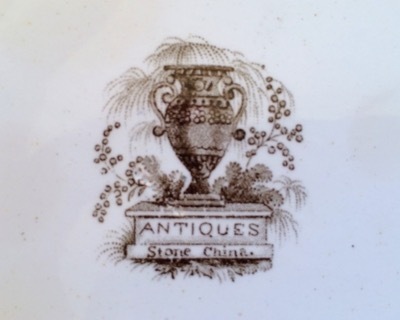 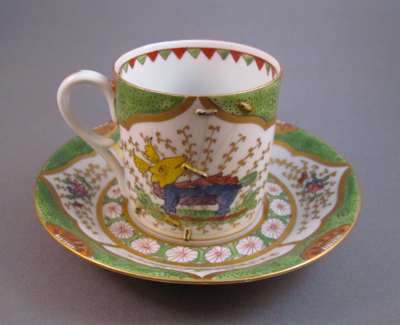 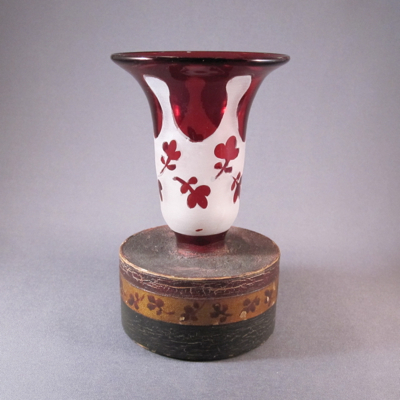 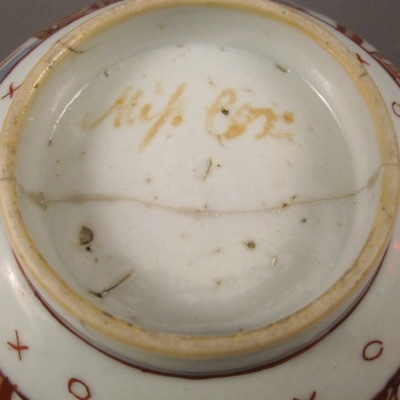 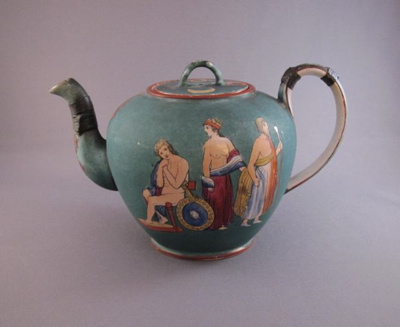 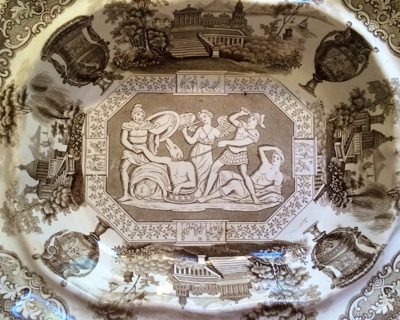 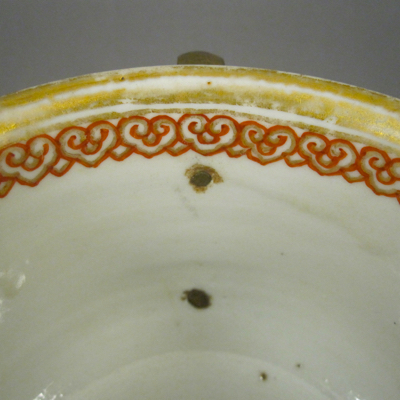 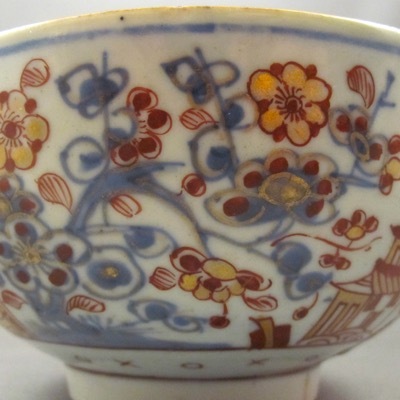 Although a potter has yet to be confirmed, there is speculation that it may have been made by Hicks, Meigh, & Johnson in Shelton, Staffordshire, between 1822 and 1835. 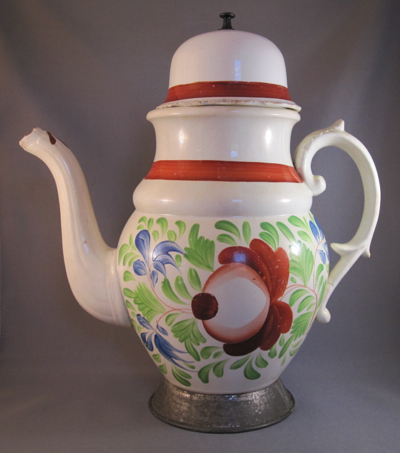 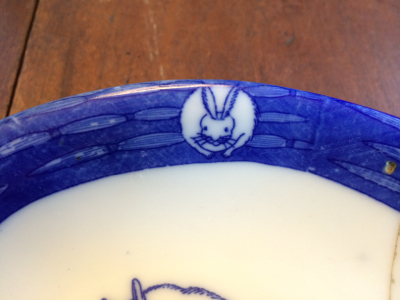 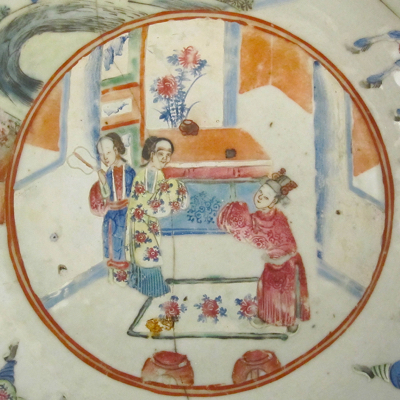 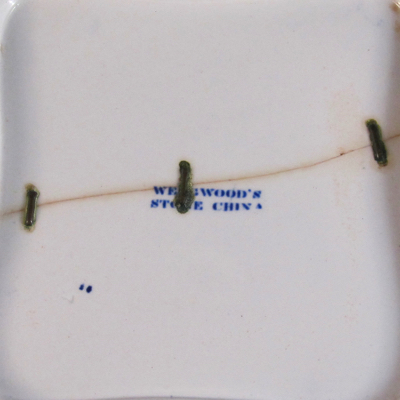 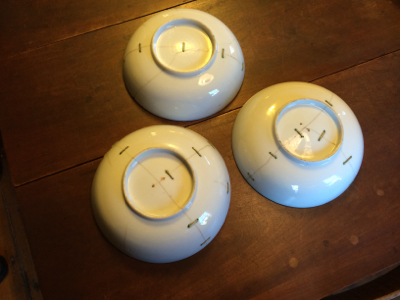 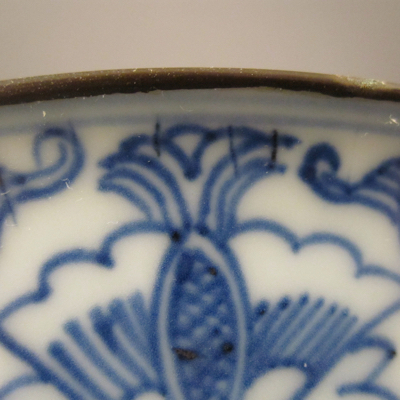 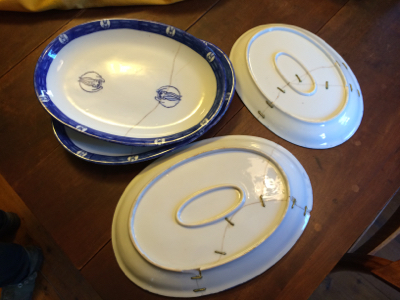 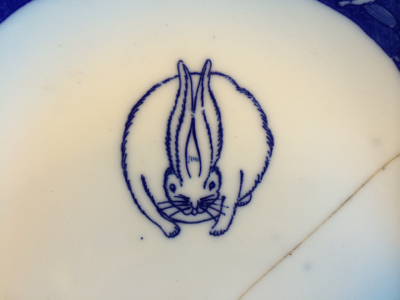 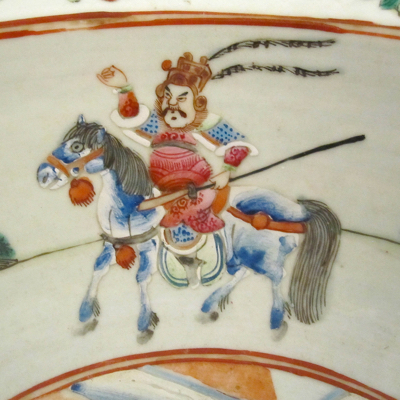 It is marked on the underside “ANTIQUES, Stone China”. 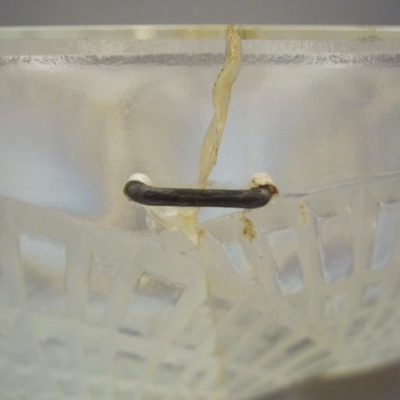 When the original handle on the cover broke off, a tinker made this chunky iron replacement. 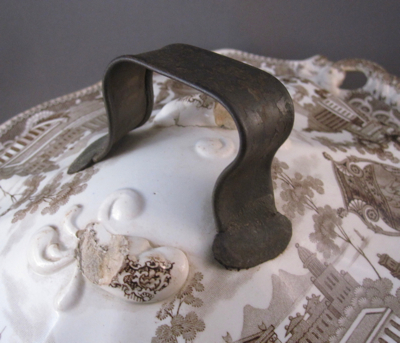 Although it in no way matches the elegance of the original handle, this sturdy repair allowed for the cover to function once again. 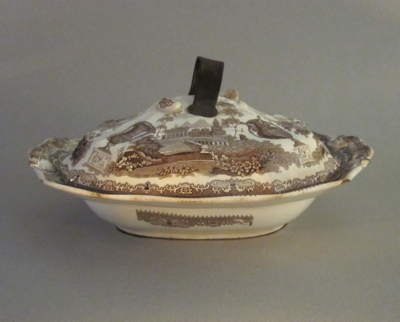 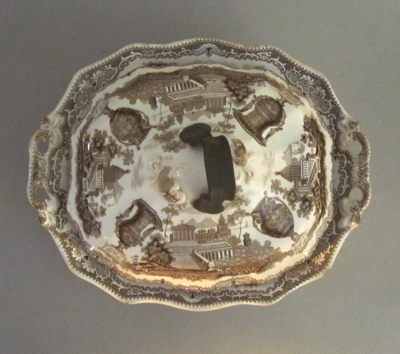 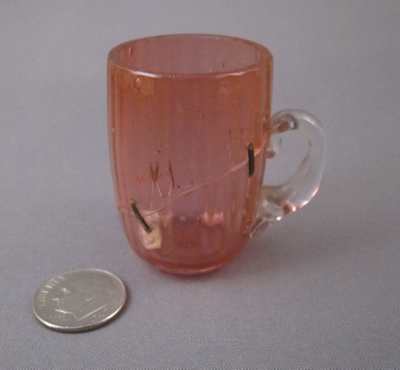 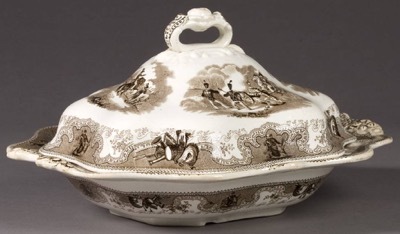 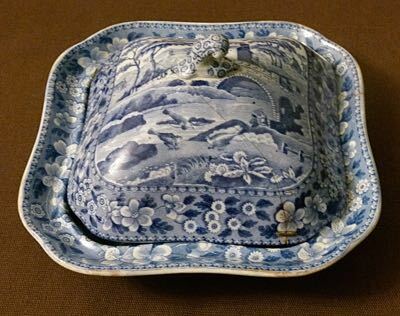 This covered dish with similar form shows what the original handle on mine might have looked like. 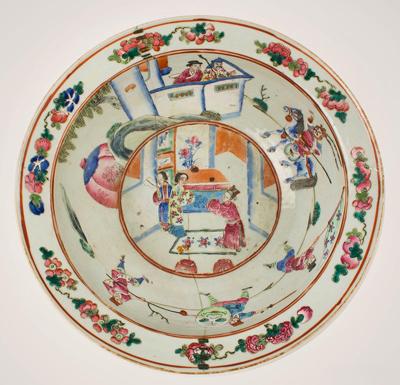 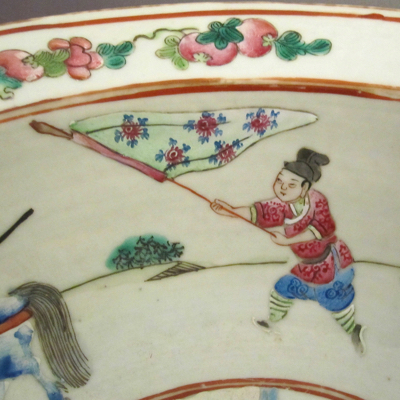 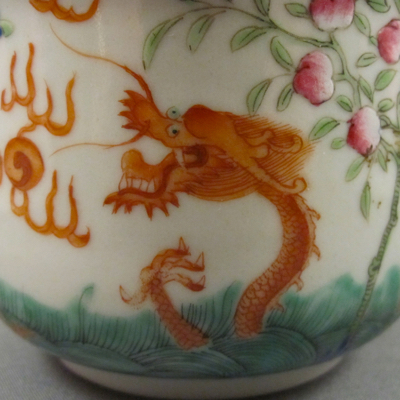 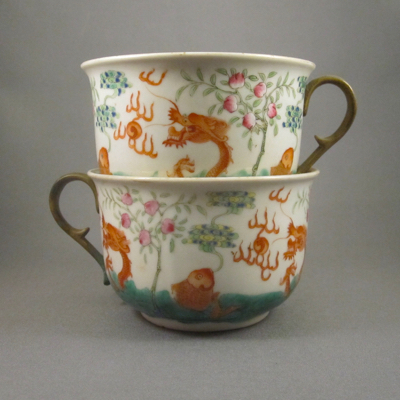 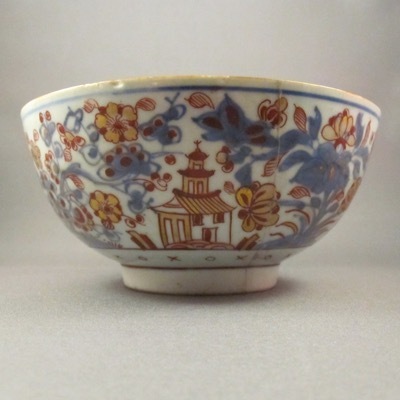 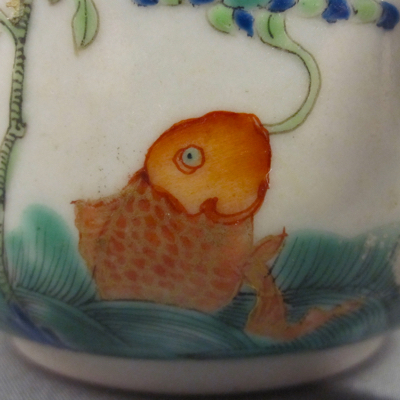 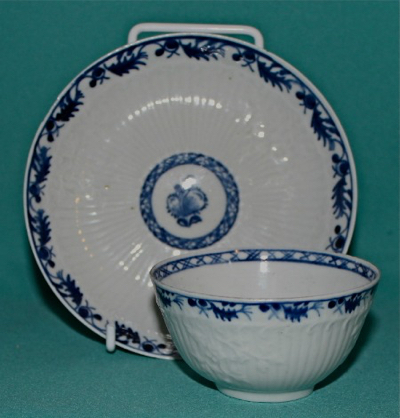 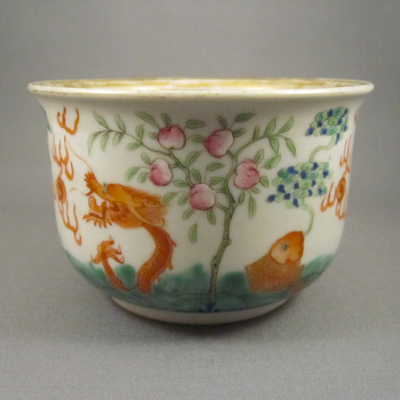 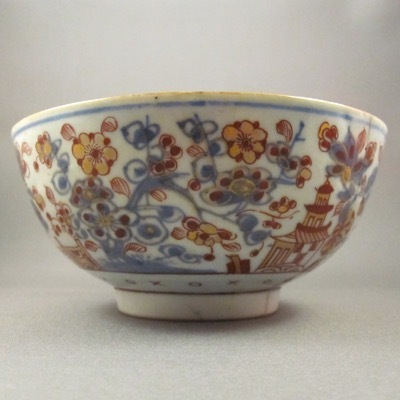 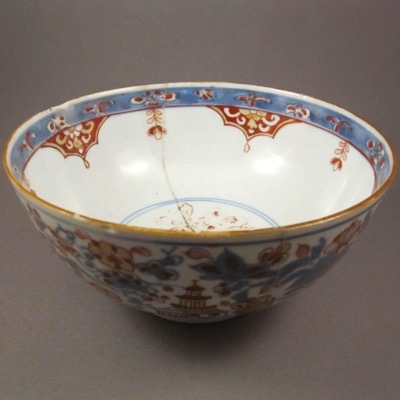 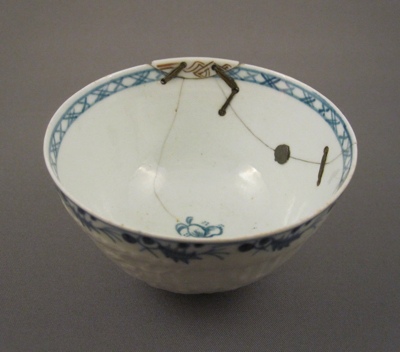 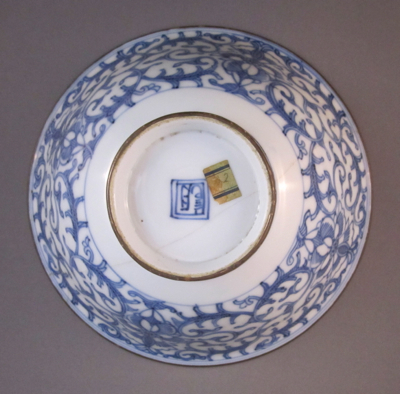 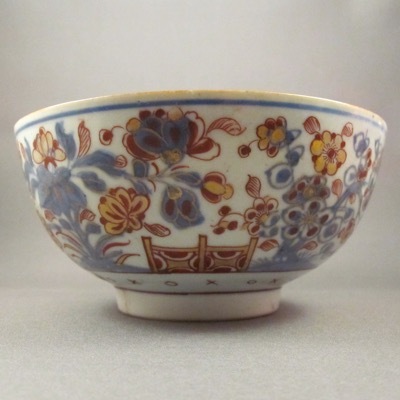 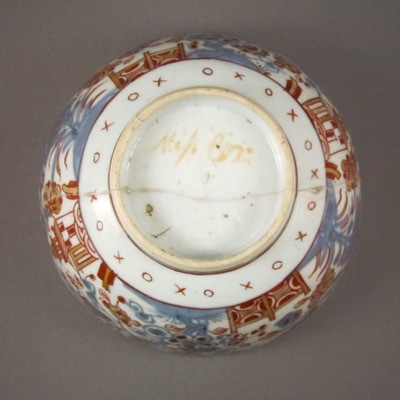 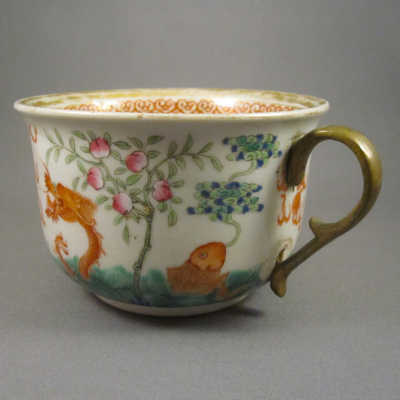 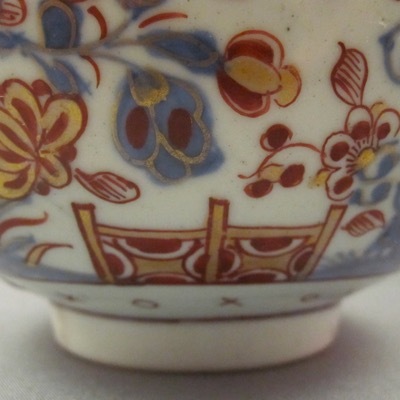 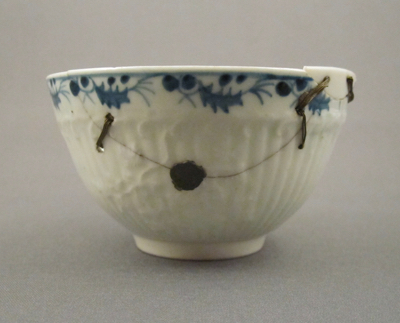 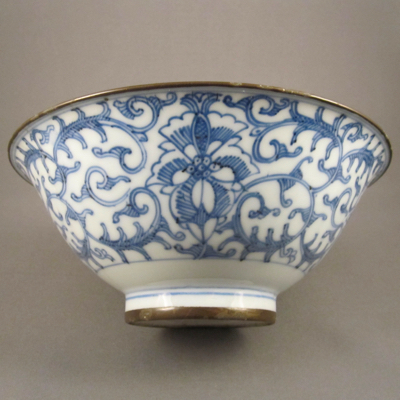 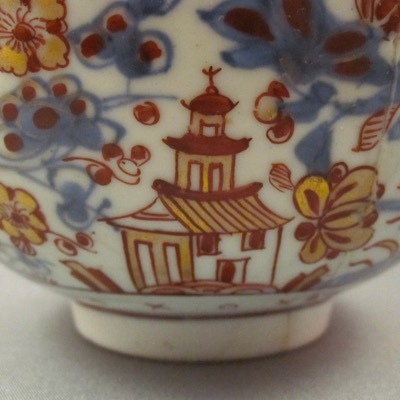 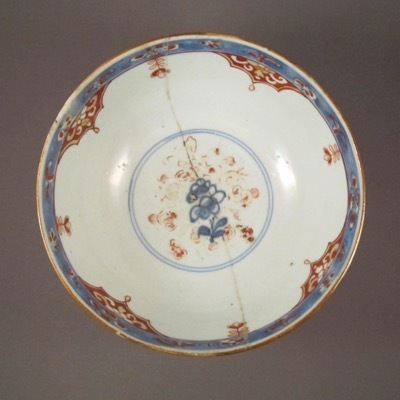 This porcelain bowl was made in China during the Jiaqing period (1796-1820) and measures 2-3/4″ tall, 6-7/8″ in diameter. 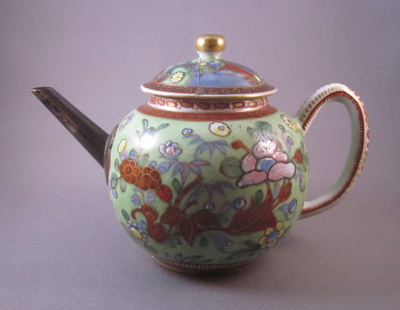 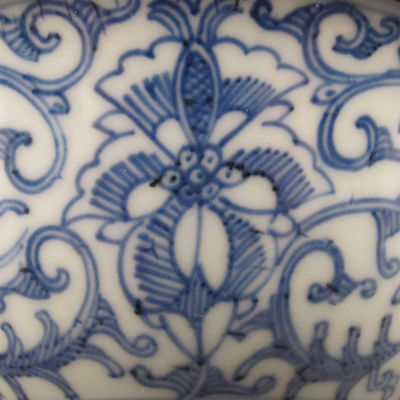 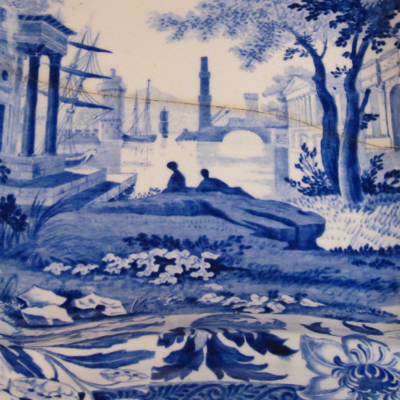 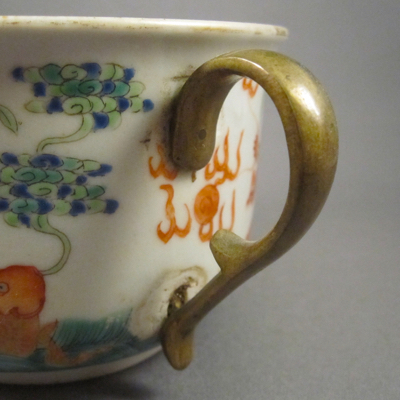 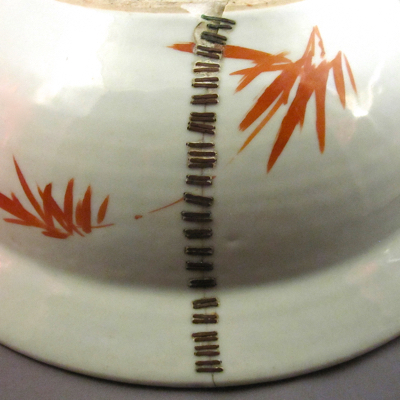 It is decorated with scrolling lotus blossoms in cobalt blue underglaze “pencil drawn” decoration, a style using cross hatched lines instead of color washes to show shading. 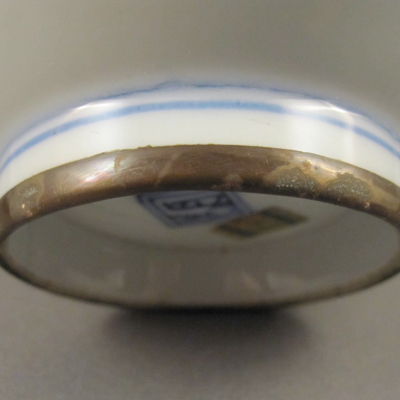 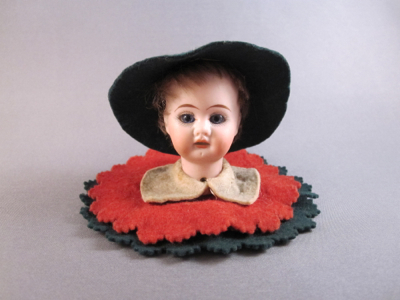 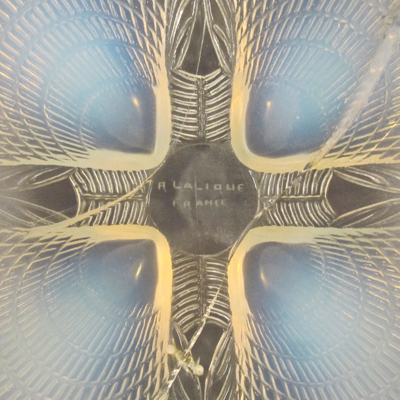 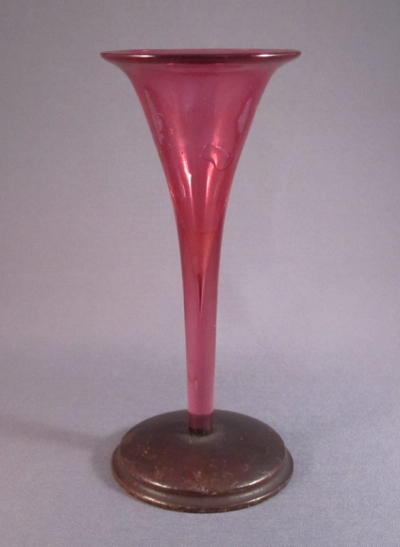 It has a blue seal mark on the bottom, as well as an early collector’s inventory label. 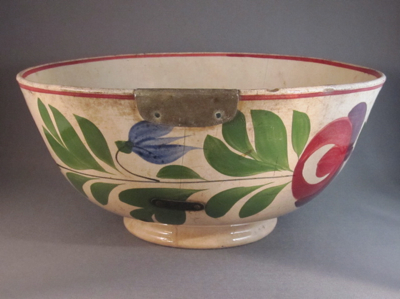 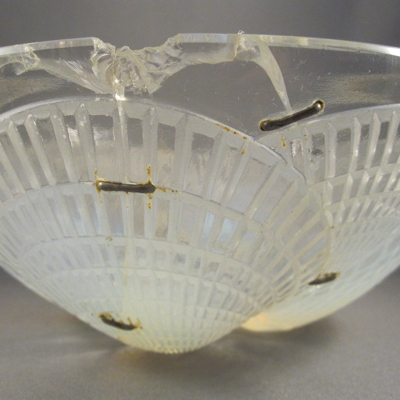 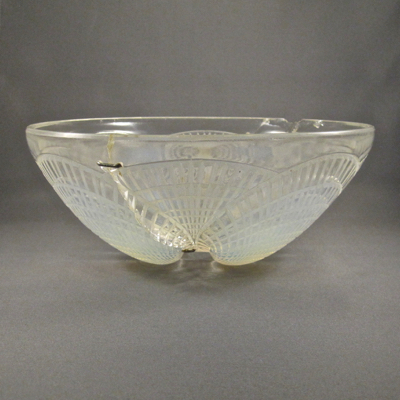 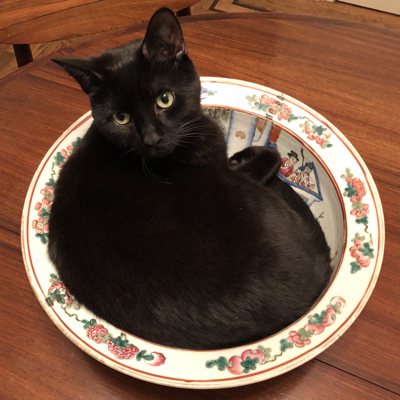 At first glance this fine bowl appears unscathed, dare I say “perfect,” showing no noticeable sign of damage or repair. 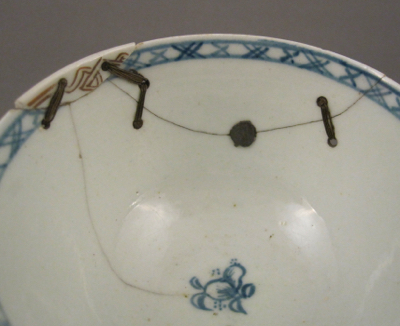 But upon closer inspection, one can see a subtle yet most effective inventive repair. 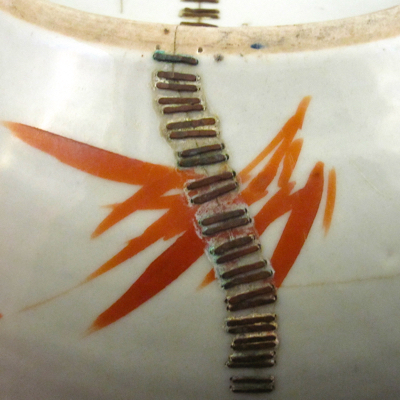 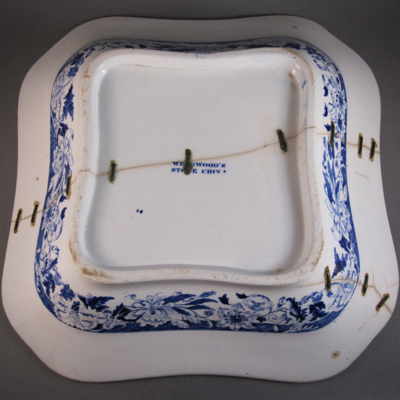 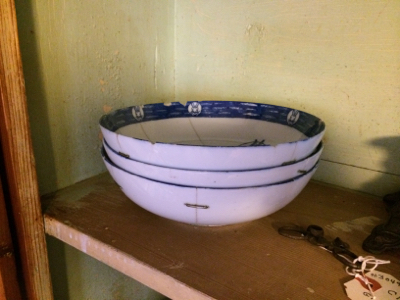 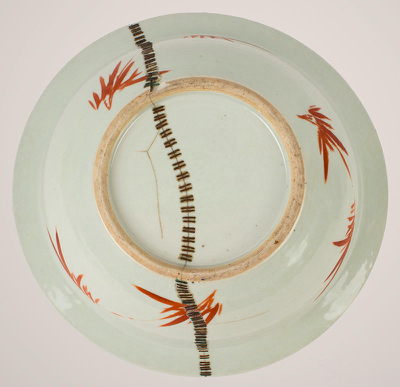 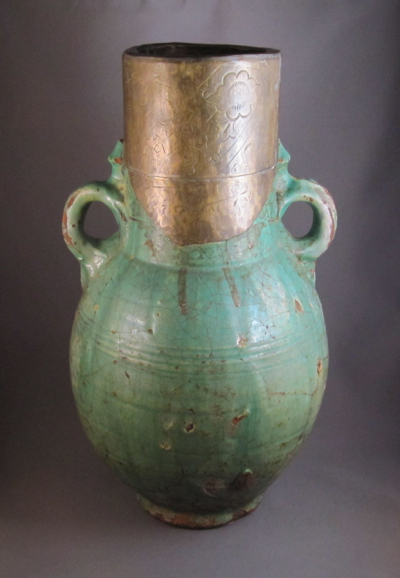 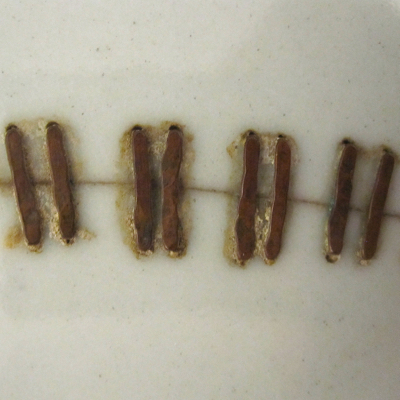 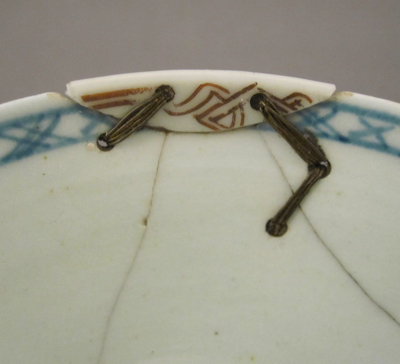 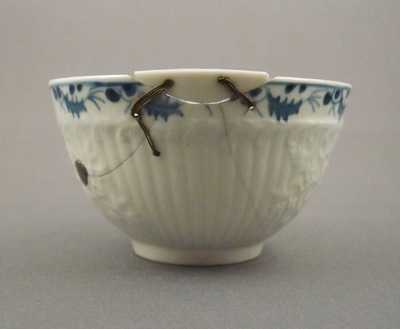 Over 150 years ago when the bowl dropped and broke in half, two simple bronze bands were attached, one along the top rim and the other encircling the base, holding the broken pieces tightly together. 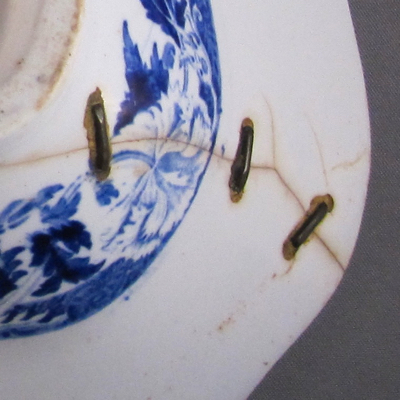 Due to the exceptional quality of the repair, I believe a skilled 19th century jeweler was responsible for this delicate work, as the top band’s thickness is an incredible 2/16″ with invisible seams. 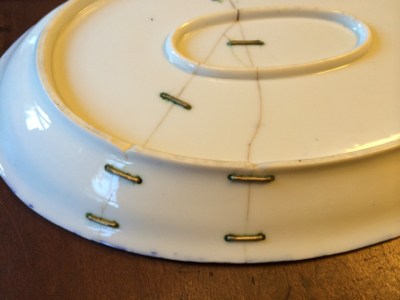 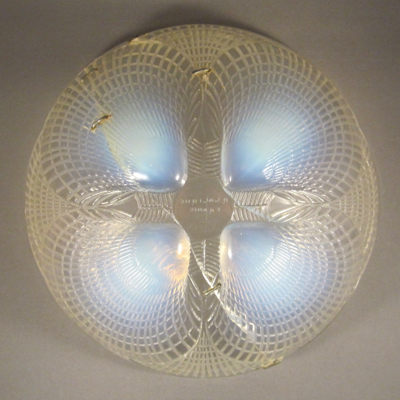 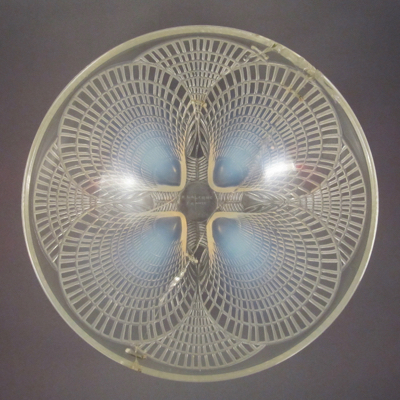 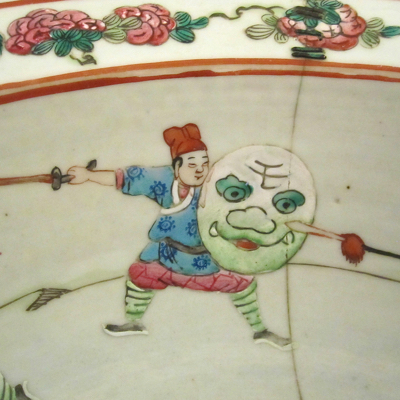 But most amazingly, not a drop of glue was used to mend this bowl.